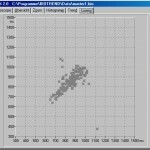 By the software BIOTREND you are able to derive some remarkable diagnostic information. The software can be delivered at an inexpensive price as optional accessory to the BIOSCOPE. To do this, the BIOSCOPE system has to be connected to the serial interface of a PC using the digital adapter BIOSCOPE-DI. 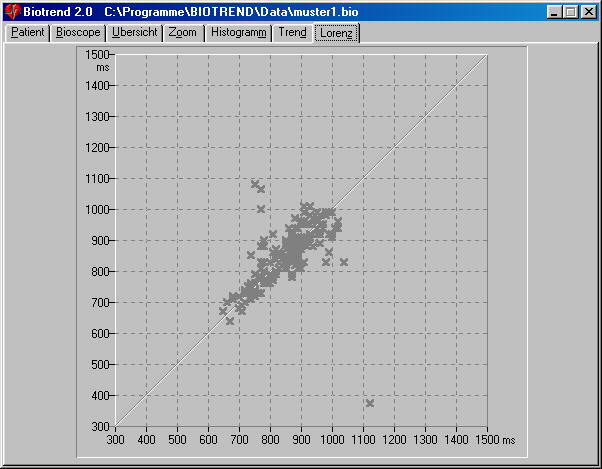 The software BIOTREND is running with Windows 95/ 98 and NT and is easy to use. 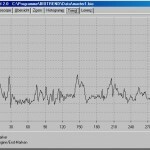 Storing and later evaluation of an ECG is just as possible as printing all represented curves and diagrams. 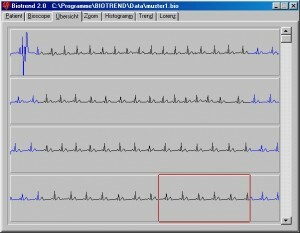 In the ECG overview the recorded signals are represented strongly reduced. With this representation you can obtain a first summary. Select a sector to enlarge (zoom) it by a double-click of the left mouse button. 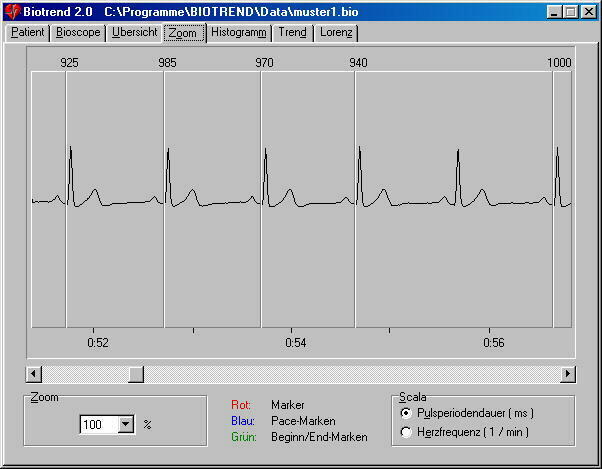 The software changes into the ECG zoom tab sheet automatically and shows the selected sequence. 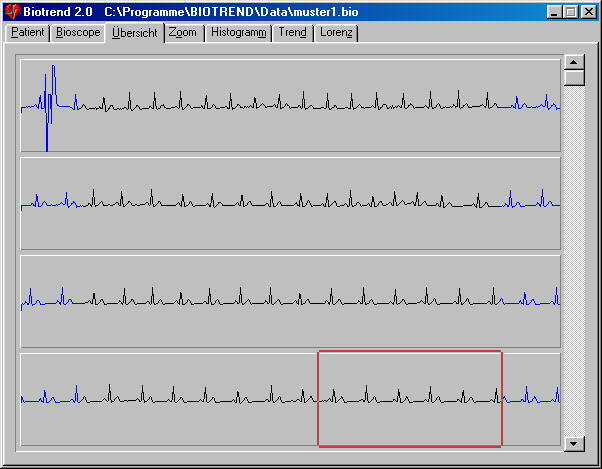 In the ECG zoom tab sheet you can have displayed the signals in different scales. 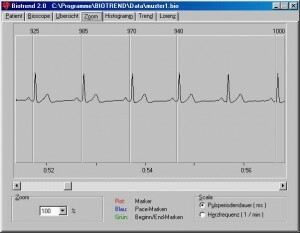 Passing through the ECG signals is carried out by using the horizontal scroll bar. 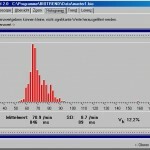 Histogram and heart rate variability (incl. the opportunity of manual exclusion of arrhythmias; definition of the upper and lower limit value of the heart rate). 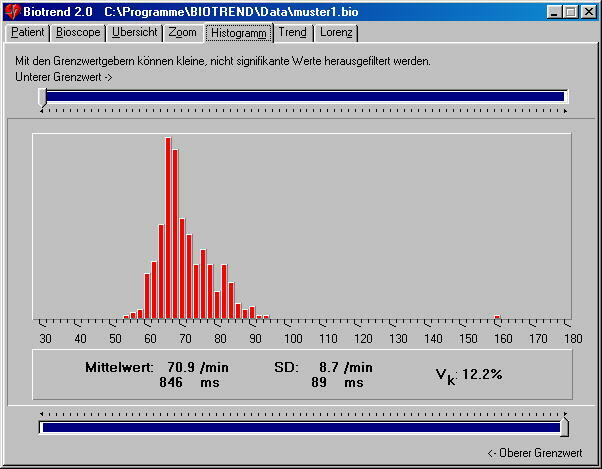 The HRV calculated from the histogram is of special interest since it contains valuable information which has won a higher importance for the diagnostics in the last time. 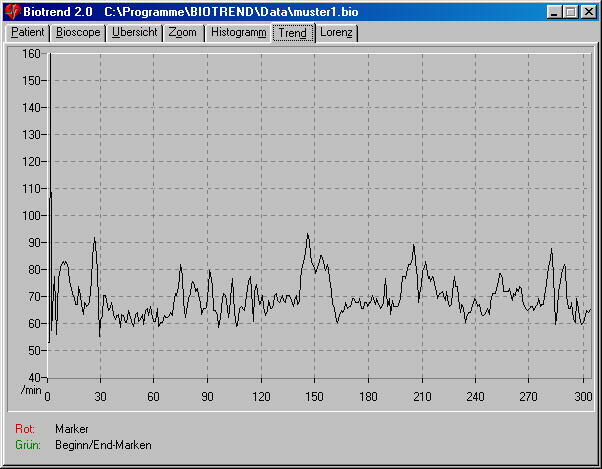 In the pathological case (primary with older patients) the HRV decreases. Finally, very small results, i.e. a no longer variable heart rate, reports a questionable situation. The Lorenz’s diagram supplies a valuable contribution for rhythm analysis.